President Xi Jinping's state visit to Britain, at the invitation of the Queen, is the first by a Chinese presidentin 10 years and marks the start of the second decade of the nations' comprehensive strategic partnership. The visit will unveil a golden era for relations. In fact, a golden glow was on the horizon when Prime Minister David Cameron in his Chinese New Year message referred to 2015 as the "golden year" for China-Britain relations and the countries' comprehensive and strategicpartnership has since embarked on a fast track. 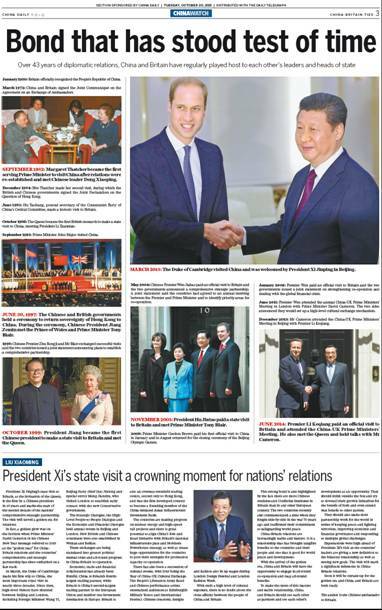 In March, the Duke of Cambridge made his first trip to China, the most important royal visit in nearly three decades. Since then, high-level visitors have shuttled between Beijing and London,including Foreign Minister Wang Yi,Beijing Party chief Guo Jinlong and special envoy Meng Jianzhu, who visited London to establish early contact with the new Conservative government. The Strategic Dialogue, the High-Level People-to-People Dialogue and the Economic and Financial Dialogue held annual events in Beijing and London. New British and Chinese consulates were also established in Wuhan and Belfast. These exchanges are being translated into greater political mutual trust and all-round progress in China-Britain co-operation. Economic, trade and financial collaboration has already been fruitful. China is Britain's fourth-largest trading partner, while Britain is China's second-largest trading partner in the European Union and number one investment destination in Europe. Britain isalso an overseas renminbi trading centre, second only to Hong Kong, and was the first developed country to become a founding member of the China-initiated Asian Infrastructure Investment Bank. The countries are making progress on nuclear energy and high-speed rail projects and there is great potential to align China's Belt and Road Initiative with Britain's national infrastructure plan and Northern Powerhouse strategy, as well as create huge opportunities for the countries to pool their strengths for production capacity co-operation. There has also been a succession of cultural events, with 2015 being the Year of China-UK Cultural Exchange. The People's Liberation Army Band and Chinese performance artists entertained audiences at Edinburgh's Military Tattoo and International Festival. Chinese creations, designsand fashion also lit up stages during London Design Festival and London Fashion Week. With such a high level of cultural exposure, there is no doubt about the close affinity between the people of China and Britain. This strong bond is also highlighted by the fact there are more Chinese students and Confucius Institutes in Britain than in any other European country. The two countries recently also commemorated a time when they fought side-by-side in the war 70 years ago and reaffirmed their commitment to safeguarding world peace. China-Britain relations are increasingly stable and mature. It is a relationship that has brought tangible benefits to the countries and their people and one that is good for world peace and development. With the arrival of the golden era, China and Britain will have the opportunity to engage in all-round co-operation and reap all-round benefits. To make the most of this mature and stable relationship, China and Britain should see each other as partners and see each other'sdevelopment as an opportunity. They should think outside the box and try to dovetail their growth initiatives for the benefit of both and even extend that benefit to other parties. They should also make their partnership work for the world in terms of keeping peace and fighting terrorism, improving economic and financial governance and responding to multiple global challenges. Expectations were high ahead of President Xi's visit as the countries' leaders are giving a new definition to the bilateral relationship as well as setting new goals. The visit will mark a significant milestone in China-Britain relations. Soon it will be curtain-up for the golden era and China and Britain are both ready.